Deliver this Puja Thali (7 � 8 inch) with Silver Plated Lakshmi Ganesha (1.5 � 2 inch), 2 Kalash, 1 Bowl and a Deeya with Haldiram�s Kaju Katli (100 Gms) and enlighten your auspicious occasion. Deliver this Puja Thali (7 � 8 inch) with Silver Plated Lakshmi Ganesha (1.5 � 2 inch), 2 Kalash, 1 Bowl and a Deeya with Haldiram�s Kaju Katli (250 Gms) and enlighten your auspicious occasion. 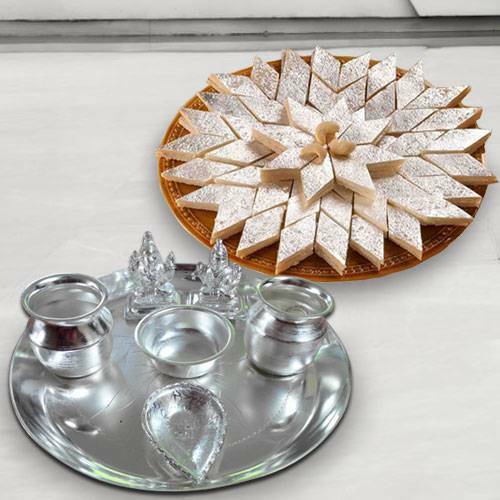 Deliver this Puja Thali (7 � 8 inch) with Silver Plated Lakshmi Ganesha (1.5 � 2 inch), 2 Kalash, 1 Bowl and a Deeya with Haldiram�s Kaju Katli (500 Gms) and enlighten your auspicious occasion.